The grill is the heart of our kitchen, and the incredible flavors of our signature ribs, steaks, seafood, and chicken come to life through our grilling techniques and the quality of our ingredients. Romacorp, Inc., parent company of Tony Roma’s, introduces a new limited time menu featuring items that showcase Tony Roma’s grilling expertise. The “Savor the Flavor of the Grill” menu brings hot off the grill flavors that are sure to have fans craving more, including Tony Roma’s World-Famous Baby Back Ribs with a new Black Pepper BBQ sauce. The limited time menu is available at participating U.S. restaurants from July 11 – September 20. Start your meal by sharing the County Fair Accordion Potato, a fun, new appetizer served with horseradish cream and Sriracha ketchup. 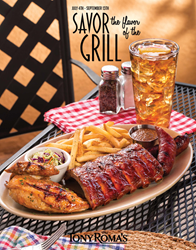 Fans craving the best of the grill will love the Summertime BBQ Trio, featuring Tony Roma’s World-Famous Baby Back Ribs smothered in a Black Pepper BBQ sauce, grilled chicken with a Peach & Bourbon Glaze, and grilled Jalapeño sausage. Or enjoy the Summer BBQ Chicken Salad with chicken straight from the grill, topped with avocado, cheddar cheese, bacon, sunflower seeds and pickled grilled pineapple relish. To cool it down, enjoy a Tony Roma’s signature Romarita®, including the new Summerberry Romarita, made with Sauza® tequila. Or try the new Strawberry Lemon Mojito, made with strawberry purée, lemon juice, mint leaves, fresh strawberries and Bacardi® rum. If it’s something sweet you’re craving, indulge in the Peach & Blackberry Cobbler served with vanilla ice cream – the perfect way to finish a great meal. Romacorp, Inc., is the parent company of Tony Roma’s restaurants, the world’s largest casual dining concept specializing in ribs. Headquartered in Orlando, Florida, Romacorp, Inc. has more than 150 restaurant locations in more than 30 countries and is one of the most globally recognizable names in the industry. The first Tony Roma’s restaurant opened more than 40 years ago in North Miami, Florida. For more information about Romacorp, Inc. and Tony Roma’s, visit http://www.tonyromas.com/.